By now, you should be accustomed to the Dodgers pursuing the platoon advantage at nearly every opportunity, whether through their starting lineups or mid-game pinch-hitting. For example, Andre Ethier has exactly 400 plate appearances this year, and 359 (92 percent) have come against right-handed pitching. 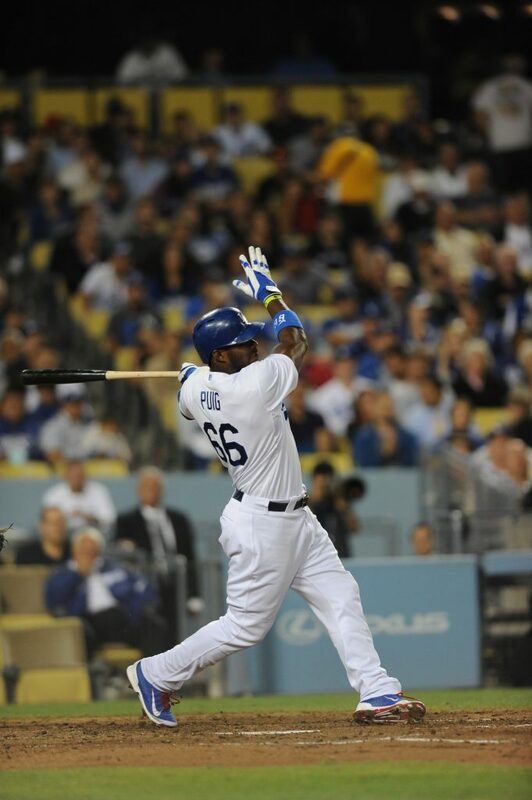 For Carl Crawford, it’s 84 percent. It got me wondering whether the 2015 squad might be the platooningest team in baseball this year, or in Dodger history. The answer is no, though it has been a while since the Dodgers have had such heavy platoon usage. Of course, these stats can be skewed by how often a heavily right-handed-hitting team faced left-handed pitching across 162 games, but you can get a ballpark idea of what teams are emphasizing. 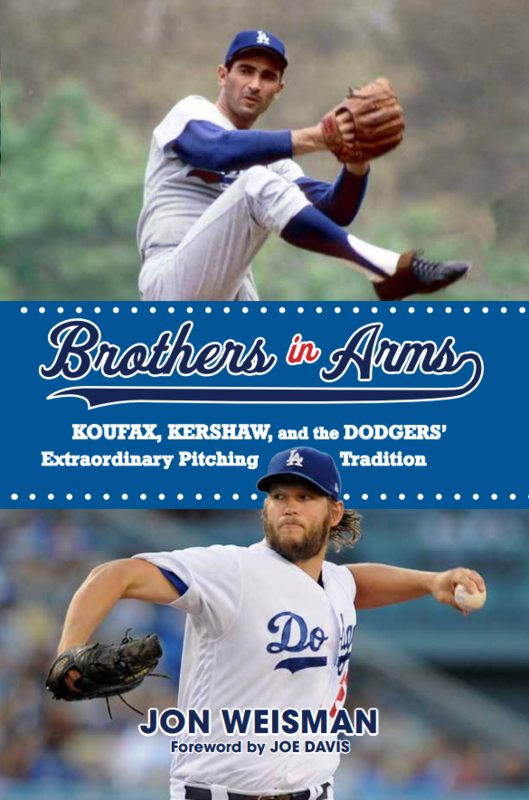 As for Dodger history … the 1965 Dodgers, which debuted the switch-hitting infield of Wes Parker, Jim Lefebvre, Maury Wills and Jim Gilliam, are the all-time franchise leaders in this category since the Dodgers moved to Los Angeles in 1958. That team had left vs. right or right vs. left almost exactly 75 percent of the time. 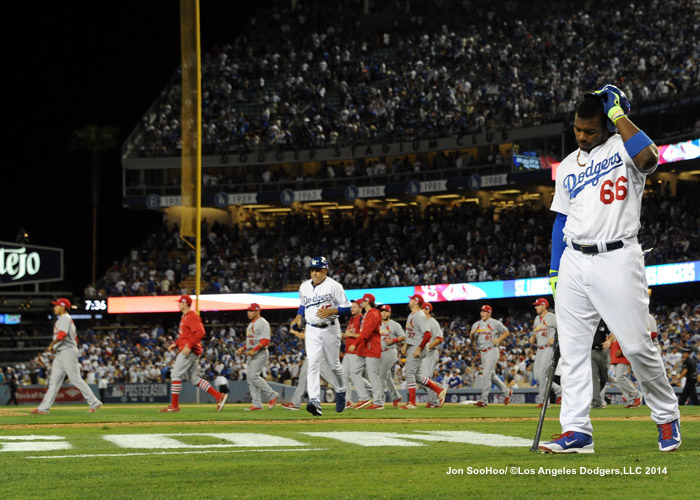 The 2015 Dodgers are at 62.3 percent, which ranks 17th on the list — but No. 2 in the past 20 years, trailing only the 2004 Dodgers (64.8 percent). 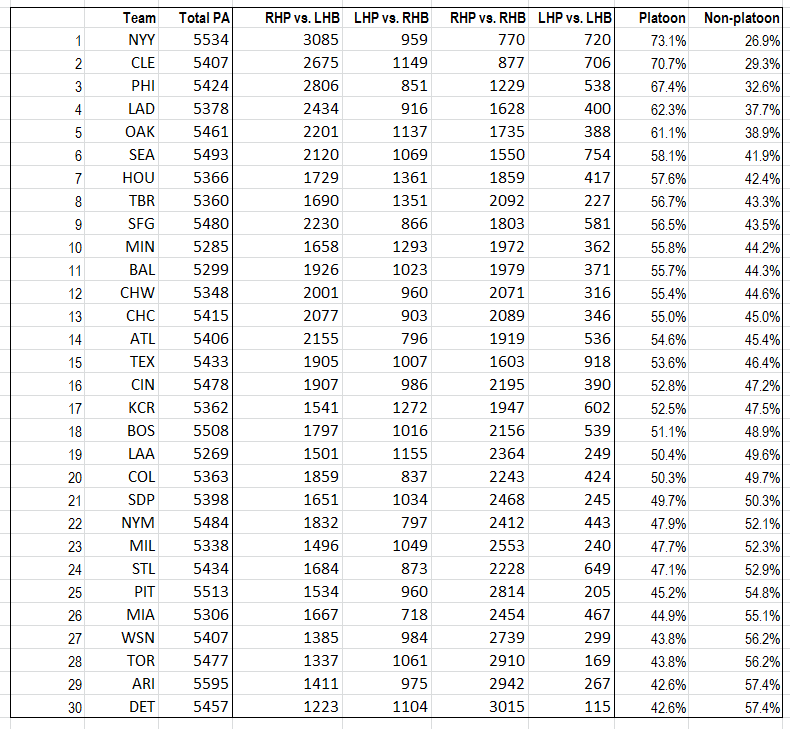 In an average game, this year’s Dodgers will have 23 platoon-advantage plate appearances and 14 at a disadvantage. Right-handed hitters Howie Kendrick (357 plate appearances), Justin Turner (292) and Yasiel Puig (230) have faced the most righties from the same side, while Adrian Gonzalez (151) and Joc Pederson (110) are tops the opposite way. The Dodgers only have 400 left-on-left plate appearances in their 143 games this year, an average of 2.8 per game. Seven of the top 10 platooning squads in Los Angeles Dodger history came along between 1961-1971, all under manager Walter Alston. The other three came from 1990-92, under Tom Lasorda. Perhaps oddly, despite the rise of sabermetrics in mainstream acceptance, no Dodger teams outside of 2004 and 2015 crack the top 20 in platoon advantage. A total of 20 Los Angeles Dodger teams have spent the season at a platoon disadvantage, including the 2014 Dodgers, which faced same-sided pitchers 53.6 percent of the time. 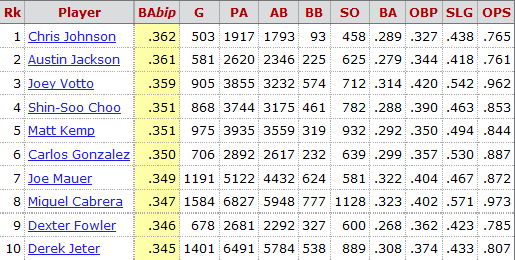 Registering lowest on the platoon scale were the 1982 Dodgers, who were at a disadvantage 59.7 percent of the year. When Adrian Gonzalez made the All-Star team earlier this month, it capped a prodigious first half in which he batted .283/.355/.520 with 18 home runs. But it also recognized a longer trend of elite production — one that reflected a return of his power. 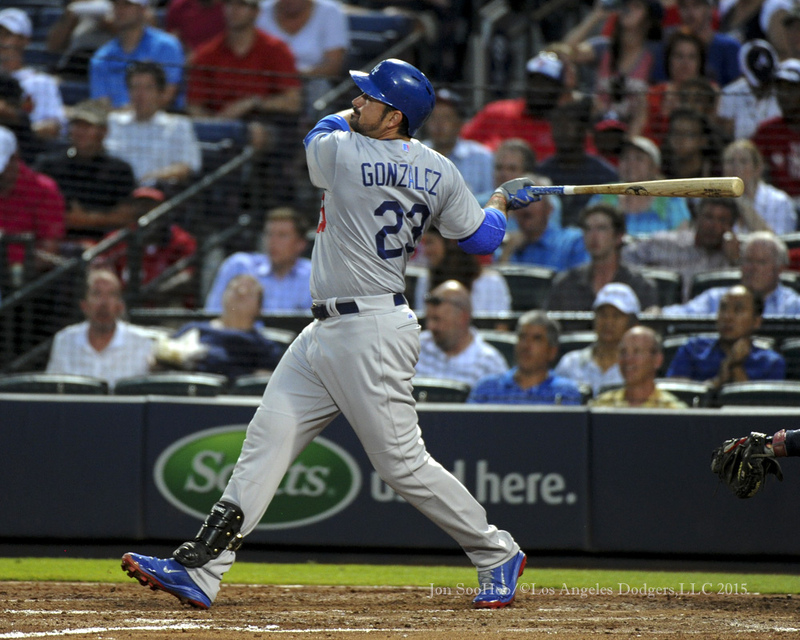 Over the past calendar year, Gonzalez has amassed a .395 weighted on-base average, following the likes of Mike Trout, Buster Posey and Jose Bautista in the Major League top eight. He has created 58 percent more runs than the average hitter. If we adjust for park and league factors, we can say that he’s been the fifth-most productive batter over his last 640 plate appearances. Throughout this timeframe, Gonzalez has done well in many aspects of the hitting game, but his power numbers have really stood out. While his .369 on-base percentage has ranked 19th among qualified hitters, his 34 home runs have placed him in the top 10, and his .559 slugging percentage has cracked the top five. In the National League, only Giancarlo Stanton, Nolan Arenado, and Bryce Harper have exceeded his .255 isolated power. So it’s evident that, since last year’s Midsummer Classic, Gonzalez has slugged with the best of them. But is it just a temporary surge? Or does it represent a more enduring reemergence of his power? 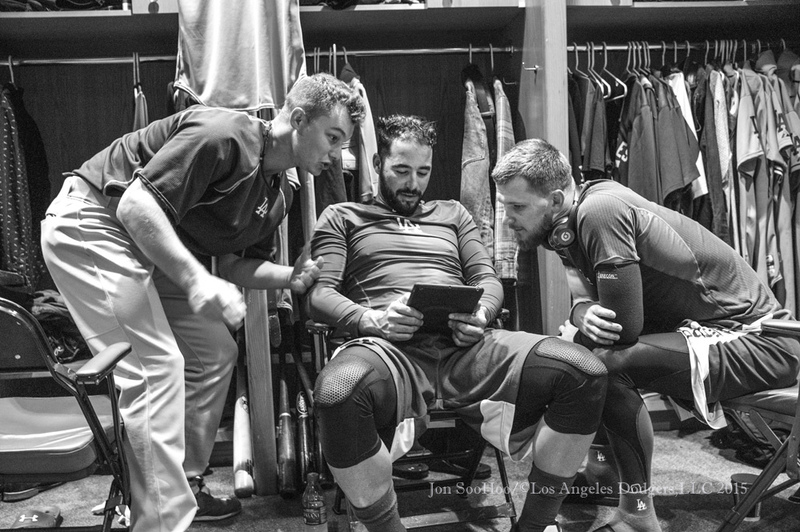 After being exposed in the 2014 National League Division Series, the Dodger bullpen has a bull’s-eye on it. But revamping the relief corps is not only going to require some dexterity, scouting and analysis from Team Andrew Friedman, it’s also going to require a fair amount of luck. Using Fangraphs, I pulled together lists of the top 125 relievers ranked by Wins Above Replacement from the 2012, 2013 and 2014 seasons. (To see the entire chart in an Excel file, click here, or look at the end of this post.) This cutoff point is fairly arbitrary, but it tells a story: Nearly half of the top 125 from 2013 failed to make the same list in 2014. How rare is it to find, let alone acquire, a durable elite reliever? 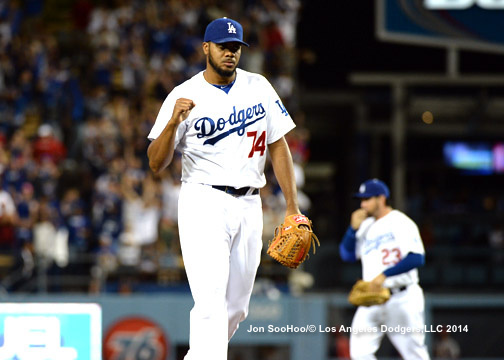 Only 10 relievers, including the Dodgers’ oft-underappreciated Kenley Jansen, have finished in the WAR top 50 for three consecutive years. Only one of those 10 pitchers, 37-year-old Seattle closer Fernando Rodney (last seen at Dodger Stadium blowing a 6-3, ninth-inning lead for the Rays in August 2013) has changed organizations since 2011. How rare is it to find a reliever that’s reliably decent? Only 36 relievers, barely one per MLB team, finished in the WAR top 125 for three consecutive years. How about just banking on a good reliever from last year? Out of the top 125 relievers in 2013, 65 (barely half) repeated in 2014. The Dodgers had two of those players in Jansen and Howell, which puts them at par for the course, though certainly not at the head of the class. Baltimore and Oakland each had five. A bit of the fluctuation results from relievers switching to or from the starting rotation. But there’s no escaping the level of inconsistency to be found in MLB bullpens — which makes sense, since nearly every reliever in existence would be a starting pitcher if he had a more dependable or varied arsenal. Despite the calls for the Dodgers to improve the bullpen this past summer before the trading deadline arrived, it’s rare for quality relievers to change teams after the season begins. Only six of the top 125 relievers in 2014 were traded midseason, with three others available as free agents or on waivers. So really, most of the work there is to be done on the Dodger bullpen — keeping in mind who’s already under contract for 2015 — has to be done before Opening Day. And it has to be done with a combination of risk-taking and restraint. And then you hope for good luck. Click to enlarge any of the files below. 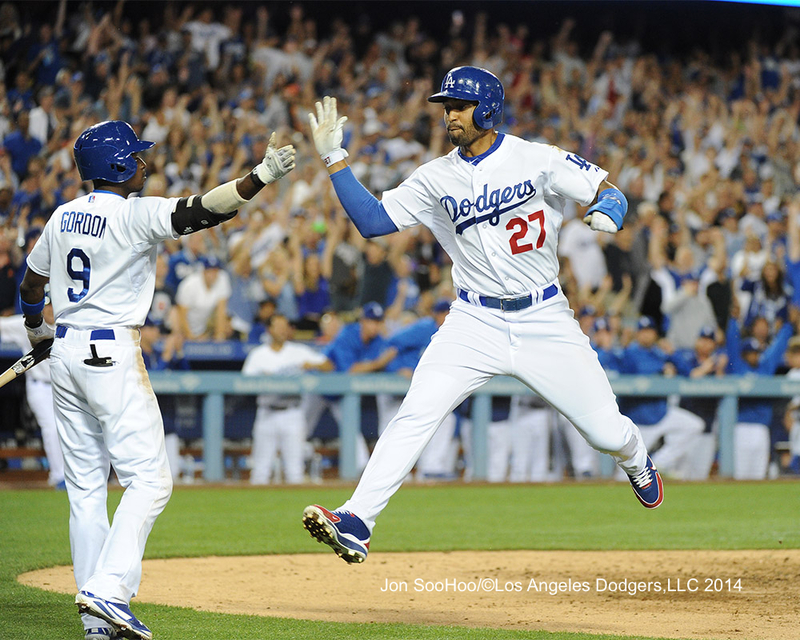 The Dodger offense has been setting the table, but that table has been upside-down. Thanks to A.J. Ellis, Clayton Kershaw, Andre Ethier and Zack Greinke, the bottom two slots in the Dodger batting order have combined to go 8 for 13 with a walk, two doubles and a home run in the National League Division Series. 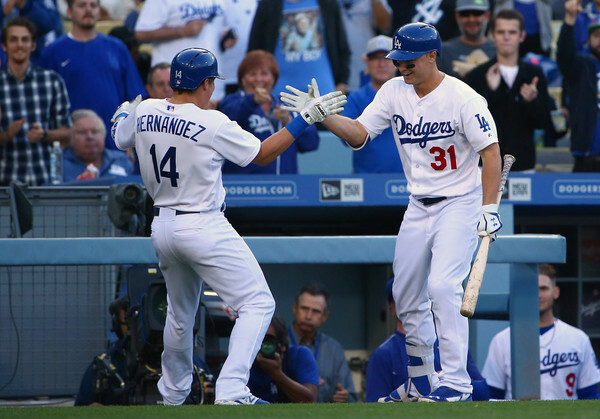 Overall, Dodger hitters have a .388 on-base percentage and .493 slugging percentage through the first two games. The top of the order has been less consistent. Dee Gordon is 1 for 9 with a walk and four strikeouts. Yasiel Puig started off 2 for 3 with a walk and that pitch that hit him, but since then he has struck out five consecutive times, immediately re-launching the easy narrative that he has become too emotional and undisciplined. 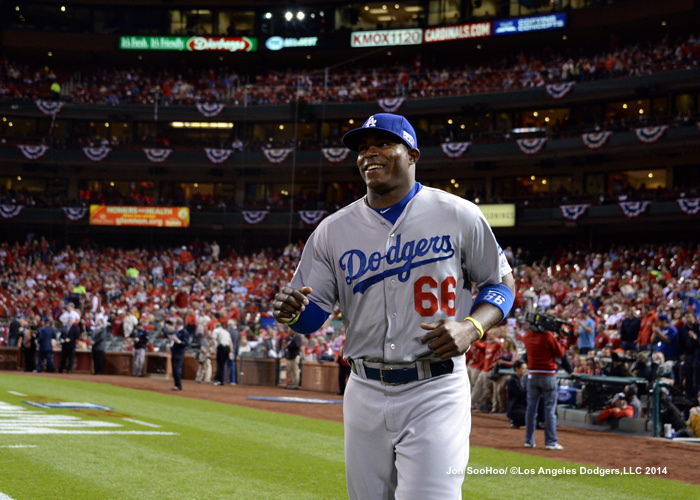 While Puig’s swing zone has become too wide, he hasn’t been going down easy. Tuesday’s 9-5 victory over Arizona was a revelry of replay for the Dodgers, with two overturned calls in Los Angeles’ favor keying a six-run fourth inning. Technically, the first challenge of the night, on the play at the plate involving Carl Crawford, was initiated by the umpires, but the next one, on Roberto Hernandez’s sacrifice bunt, came from the Dodgers and also went in their favor. That gave the Dodgers 17 successful challenges in this first year of replay — which almost puts them dead even with the 19 overturned calls that have gone against them in 2014. However, the calls against the Dodgers have come more often in close games. Clutch much? Dodgers actually crisp with RISP, but is it ever enough? Ducks on the pond, stranded. It’s enough to make you quack up. Short of the final out of a loss, there’s hardly a worse feeling in baseball for an offense than failing to cash in on scoring opportunities. In fact, the sight of a team stranding runners in scoring position is so unbearable that everyone, from fans to the media, usually thinks of their team as a disappointment in clutch situations — even when that team is doing all that can be expected. It’s certainly no different if you’re following the Dodgers. Heading into the All-Star Break, the Dodgers weren’t known as a clutch team — if anything, they were dogged by a rather bizarre pileup of failings in bases-loaded situations, in which they had gone 11 for 63 (.175) with as many hit-by-pitches (two) as walks. Yet with runners in scoring position, the Dodgers had the highest on-base percentage (.354) in the Majors. By that measure, Los Angeles was home to the most clutch team in the baseball. You could even argue that the Dodgers, like the prototypical when-the-chips-are-down hero, turned it up when the pressure was on, given that their offensive stats were better with runners in scoring position than with the bases empty. But even here, one has to be careful with how to interpret these numbers. The more you dive into analyzing specific situations, the more the statistics succumb to the frailties of small sample size. What’s the best part of Clayton Kershaw’s 36-inning scoreless streak, now the third-longest in Dodger history after his latest magical act, taming Coors Field in a 9-0 Dodger victory? That he’s struck out 35 percent of the batters he has faced? That opponents have an OPS against him – not batting average, but OPS – of .292? That 18 of the 36 innings have been perfect innings? That while opponents are batting .124 against him, Kershaw has hit .273 against his opponents? 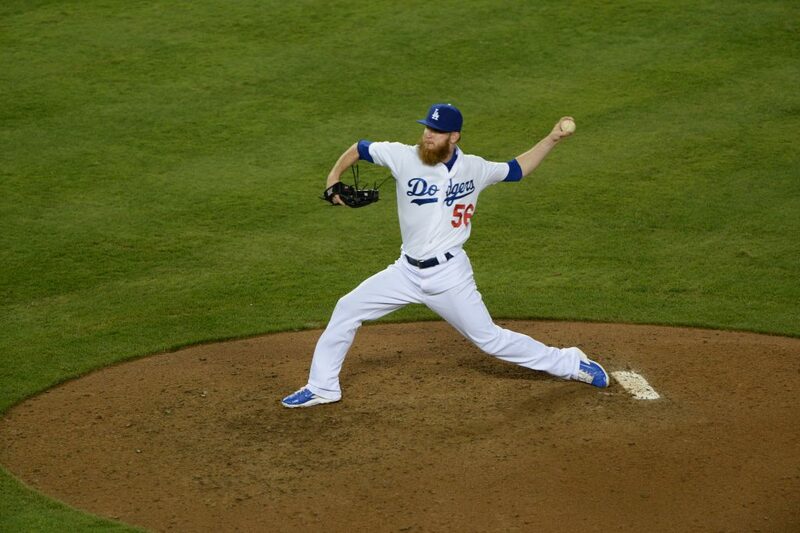 Spoiler alert: What looks like the Dodger righty’s worst season might actually be his best. I’ll admit, there have been times when I’ve thought I’m the naive one for not giving up on a player. But then came Juan Uribe. 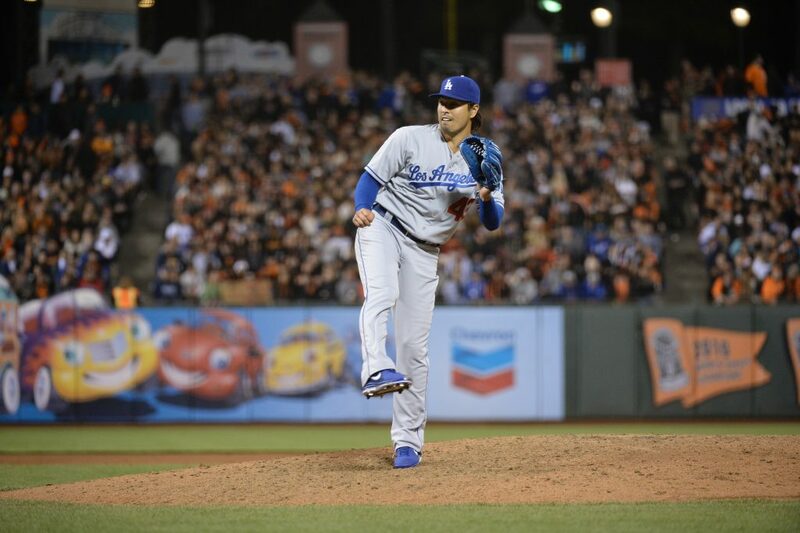 And now comes Brandon League. 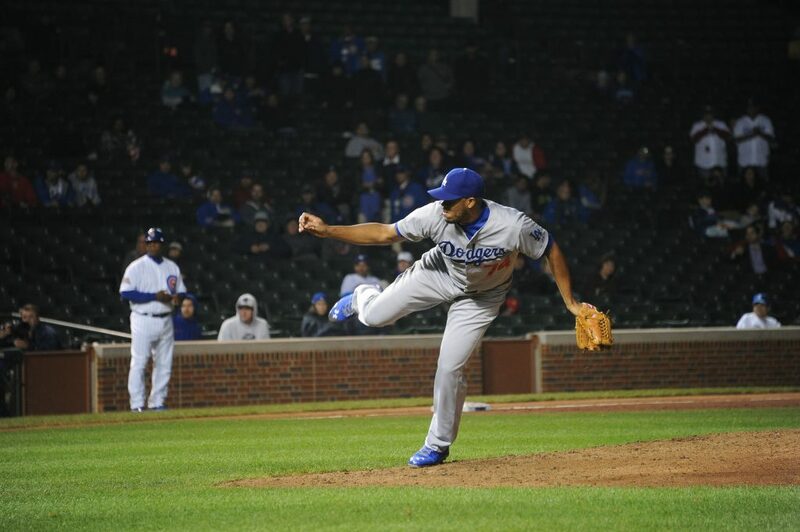 A pitcher that a number of Dodger fans were rooting for to be released, who allowed 87 baserunners and a 5.30 ERA in 54 1/3 innings in 2013 and half of his inherited runners to score, has now thrown 16 1/3 consecutive innings without allowing an earned run, stranded seven of eight inherited runners and been unscored upon in 12 of 14 appearances in 2014. Here’s a game-by-game look at the 10 appearances that have encompassed his scoreless streak, followed by what passes as analysis from me (with help from Baseball-Reference.com). Photo: 2013 strikeout leader Clayton Kershaw throws his simulated game Sunday. 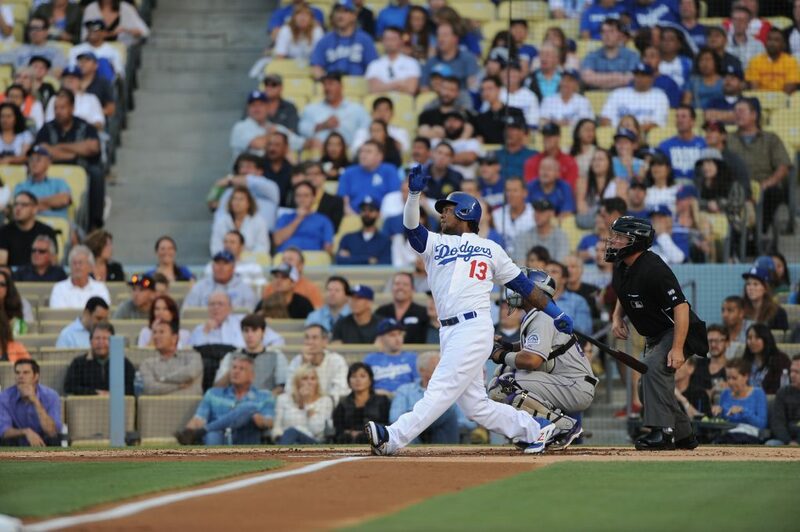 Dodger hitters have never struck out more than 1,190 times in a season, a record set in 1996. This year, they’re on pace for 1,501. 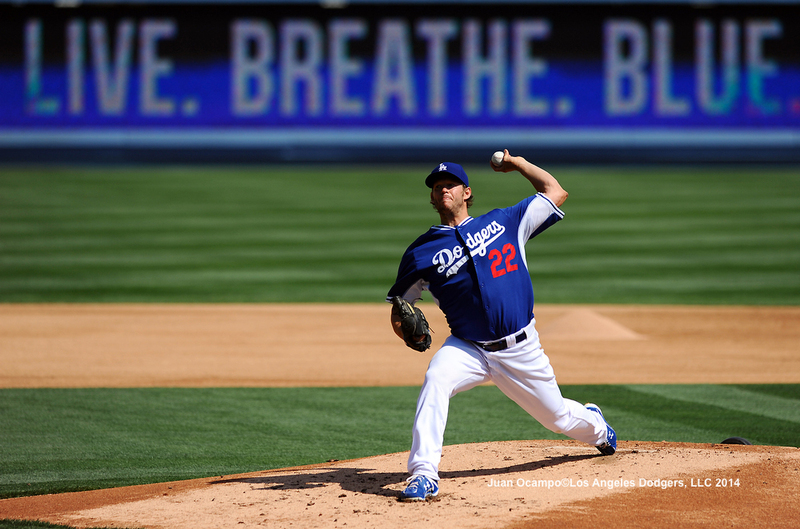 Dodger pitchers have never struck out more than 1,292 batters in a season, a record set in 2013. This year, they’re on pace for 1,543. And Clayton Kershaw hasn’t pitched in a game since March. 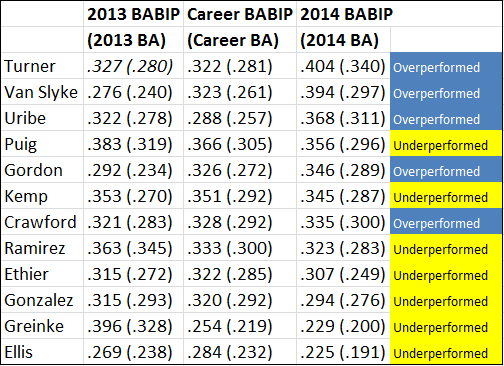 Matt Kemp has the highest career BABIP in Dodger history — what does this mean? If it’s better to be lucky than good, it’s best to be both. Matt Kemp has the interesting dichotomy so far this year of a .194 batting average with an .890 OPS, thanks to the fact that he has seven walks, three homers and two doubles but only one single in 38 plate appearances. Of those 15 times, he has gotten only the aforementioned double doubles and single single, for a .200 batting average on balls in play. That’s on the unlucky side. I remembered that early in his career, Kemp had high BABIP numbers — folks who followed such things were always wondering if his BABIP would hold up as he got older — so I decided to see when the decline happened. Going into this season, Kemp had a career BABIP of .352. (It has since dropped to .351.) I’m no super-expert on stats, but this struck me as extraordinary. And, in fact, it’s tops in Dodger history. Kemp is also near the top in the Majors over the past 10 years. If Derek Jeter’s presence on this chart is any indication, BABIP is not necessarily something that declines significantly in your 30s. (Jeter was at .364 in his 20s, .345 since.) We’ll see, of course, in Kemp’s case. But I wouldn’t worry about that .194 batting average too much, or in any case, I’d be much happier about his returning power numbers than sad about the arguably temporary loss of singles.